One of the best things about being a pet writer is the chance to meet the amazing people who work in animal rescue, like two teens named Morgan Wells and Wyllow Hildner. They like to say, "You're never too young to change the world," and it's a concept they live by - they were just 10 and 11 years old when they met as volunteers at the La Plata County Humane Society in Durango, Colo.
"I have always loved dogs because they are such great companions and never judge you," Wells says. "They will protect you with their lives and always want to please you. They love you so much and it's only fair if we help them out of sticky situations." One day the girls met Kaya, a "sweet" pit bull in the shelter's "Lonely Hearts Club," the name for animals who have gone 45 days without being adopted. 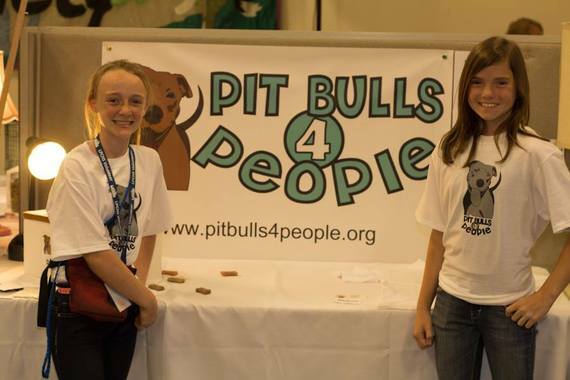 They learned about the challenges facing Kaya and other pit bulls because of their fearsome reputation and decided to do something about it by founding Pit Bulls for People. Wells and Hildner created a website at PitBulls4People.org that shares photos, videos and descriptions of "pitties" available for adoption at the shelter. They get to know the dogs' personalities on weekends and during summer vacations when they socialize and train the pups to help increase their adoption chances. 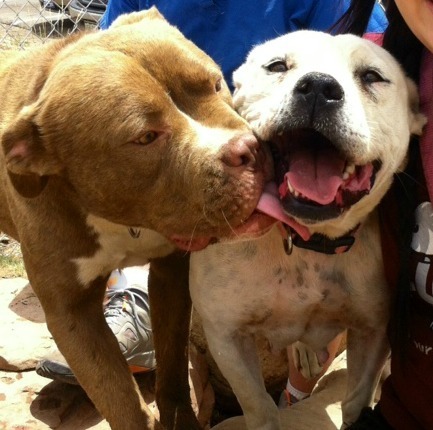 Often they meet with potential adopters to introduce them to the dogs. 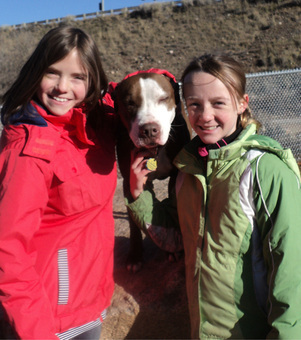 "Working with pit bulls is one of the best things I've ever done," Hildner, now 14, told me. "They give actual meaning to the phrase 'Don't judge a book by its cover.' They may look big and strong, but they are one of the sweetest breeds I've ever known. Just knowing that these dogs are being used for the wrong things makes me want to do something about it even more." Since founding Pit Bulls for People in 2013, the girls have helped the shelter find homes for over 150 adult pit bulls - including Kaya - and raised more than $1,000 for the cause. "I love working with pit bulls because they're smart, though they don't always catch on super quickly," Wells, now 13, says. "They are really funny to see when you praise them for doing something right. They always get so happy with their tails flying and their tongues trying to reach your face." Chris Nelson, shelter director of the La Plata County Humane Society, finds the dedication of the girls inspiring. "They work really hard for the pit bulls that we get in here, and they've been a big help to us," he says. "They're passionate." Wells and Hildner are also active volunteers with Soul Dog Rescue, a Denver-based nonprofit that frequently hosts spay/neuter clinics on the Navajo Reservation, which covers over 27,000 square miles across three states. The girls help in whatever way needed, from caring for animals recovering from surgery to going out on rescue missions. In one memorable instance, they helped save a litter of puppies spotted by an old tire - they named the pups Hope, Faith, Joy and Peace. "They were covered in dirt and ticks. We went back and washed them all off in the sink," Hildner says. "The feeling of holding the dog you just rescued is priceless." Both Hildner and Wells plan to continue working in animal rescue as adults. They are committed to combatting breed specific legislation and educating the public that pit bulls - an umbrella term that includes American pit bull terriers, American Staffordshire terriers, Staffordshire bull terriers and pit bull mixes - can be wonderful pets when treated right. "Pit bulls are a very energetic breed. They need to have owners who love to exercise and can give a lot of attention to them," Hildner says. "If you spend time with them, keep them healthy, and give them love, they will be the best dogs ever. Regular socialization is also very important for any dog." 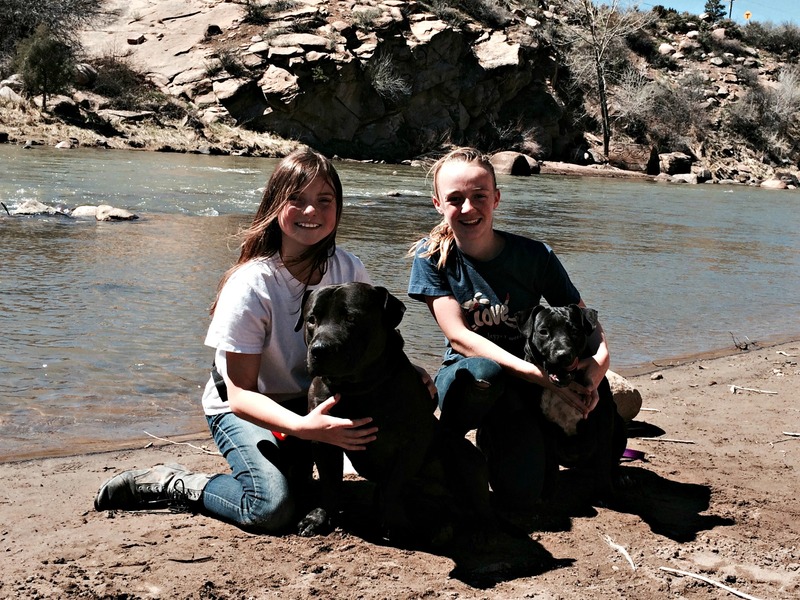 Wells and Hildner are quick to praise others, from their parents being supportive even when they ask for early morning rides on weekends, to La Plata County Humane Society making Pit Bulls for People "possible." They hope other young people will get involved in rescue and learn how to stop animal abuse and neglect. "It's very important that kids grow up to respect the animals around us ... To dogs, the glass is always half full. And it doesn't matter how you look or who you are, they will always give you unconditional love no matter what," Hildner says. "I could talk for hours about how great dogs are." For more information, visit http://www.pitbulls4people.org/ or https://www.facebook.com/PitBullsForPeople/.